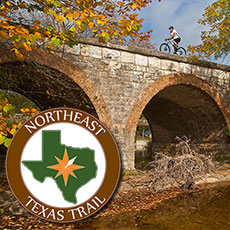 ...and the fourth longest in the United States—the Northeast Texas Trail (the “NETT”). The NETT spans 134 miles from New Boston to Farmersville (East of Dallas). It crosses over the Sulphur River and through nineteen rural towns. Scenery includes several creeks and more than 100 rail bridges. Although portions of the NETT have been made accessible over the years, the NETT’s official opening was in April of 2018. Comments on "Did You Know: Texarkana is just miles from the longest pedestrian, bicycle, and equestrian trail in Texas"